Living NEW Ministries in Jacksonville, Florida, is a nonprofit organization founded by Pastor Wayne Young that is built on his ministry ideal of Living NEW. This new strategy incorporates the belief that all should follow the devout holy life of never-ending worship. Our organization offers church, ministry, pastor and leader training about this transformation of Living NEW to individuals in the US, Canada and other areas around the world. Passionate about developing a renewed awareness of God in others, Pastor Wayne founded our organization more than ten years ago after spending many months of prayer. After traveling abroad assisting other pastors, he realized that God had called him to challenge others to rethink their approach to God and worship. Our ministry calls for all to live a life of constant worship, which enables all to experience the presence of God every day. Pastor Wayne has been involved in ministry for over 25 years. He currently is the lead pastor at WestGate Church in Jacksonville, Florida, and was involved in establishing three churches prior to his current role. He started the Chaplaincy Ministry of the Jacksonville Fire and Rescue Department in 1992 while serving as a firefighter/paramedic there. To this day, he continues to serve as a chaplain for fire and rescue departments when called upon to do so. For several years, Pastor Wayne was part of a cross-denominational unity movement in Jacksonville, serving on the Executive Leadership Team of the Mission First Coast, a spiritual transformation ministry. During this time, he developed the movement in hopes of breaking down racial barriers within the Body of Christ, foster joint worship services between different churches, and strengthen churches by merging churches that were experiencing difficulties. Pastor Wayne has traveled to India, Bulgaria, Uganda, Guyana, Australia, and the Philippines to assist on mission trips, conduct conferences and seminars, preach evangelistic meetings, and work in medical clinics. 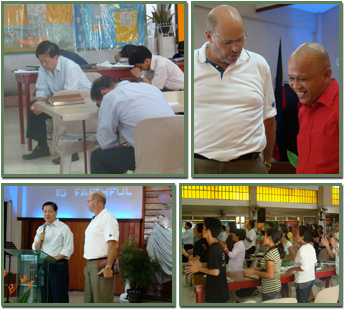 A majority of his time is spent serving as a spiritual father to other pastors all over the world. He trains and encourages them in the Name of Christ. Believing in the importance of education, Pastor Wayne obtained his Bachelor's degree in Theology, Master's degree in Christian Education, and a Doctorate degree in Ministry. He earned an Honorary Doctorate of Divinity and has served as a guest professor and lecturer at various Bible schools and seminaries. Also, he published, The Forgiveness Factor. Pastor Wayne is married to his high school sweetheart, Vicki, and they have a son, Jared, two daughters, Ashley and Courtney, and two grandchildren. Courtney is married to Nik.